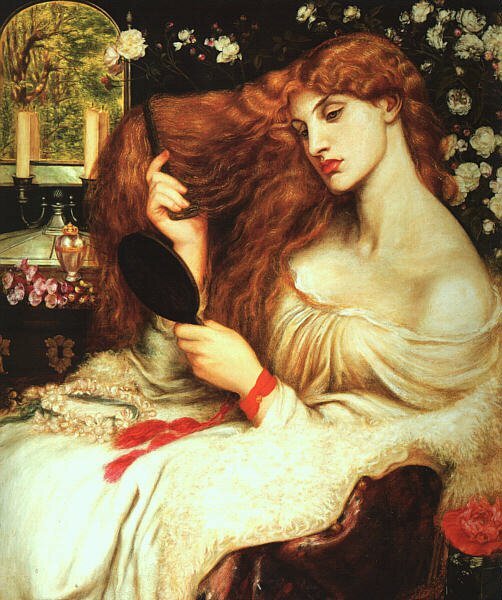 Dante Gabriel Rossetti, original name Gabriel Charles Dante Rossetti (born May 12, 1828, London, England-died April 9, 1882, Birchington-on-Sea, Kent) British painter and poet who helped found the Pre-Raphaelite Brotherhood, a group of painters treating religious, moral, and medieval subjects in a nonacademic manner. 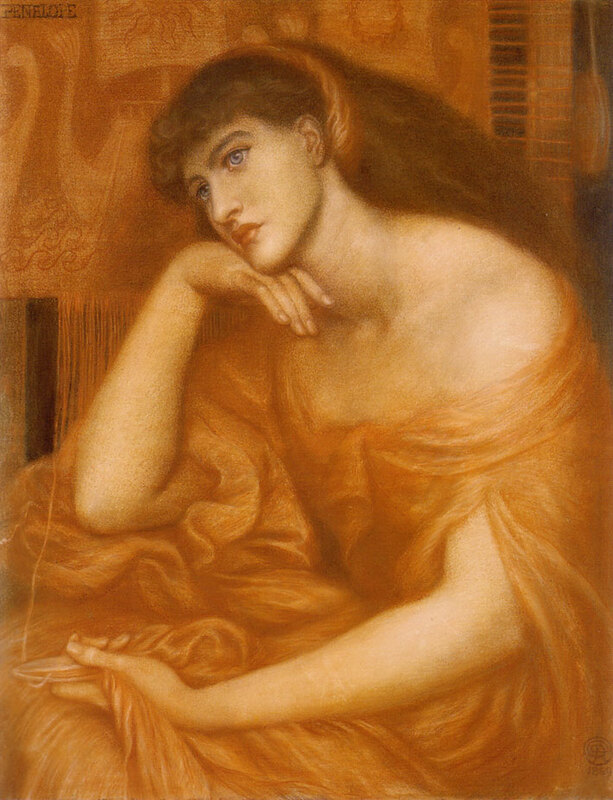 Dante Gabriel was the most celebrated member of the Rossetti family. 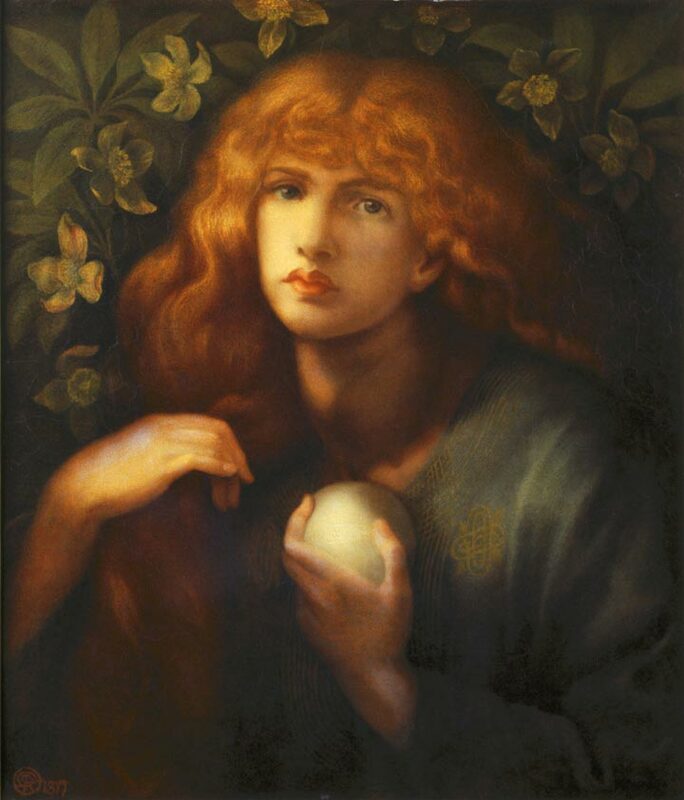 After a general education in the junior department of King’s College (1836-41), Rossetti hesitated between poetry and painting as a vocation. 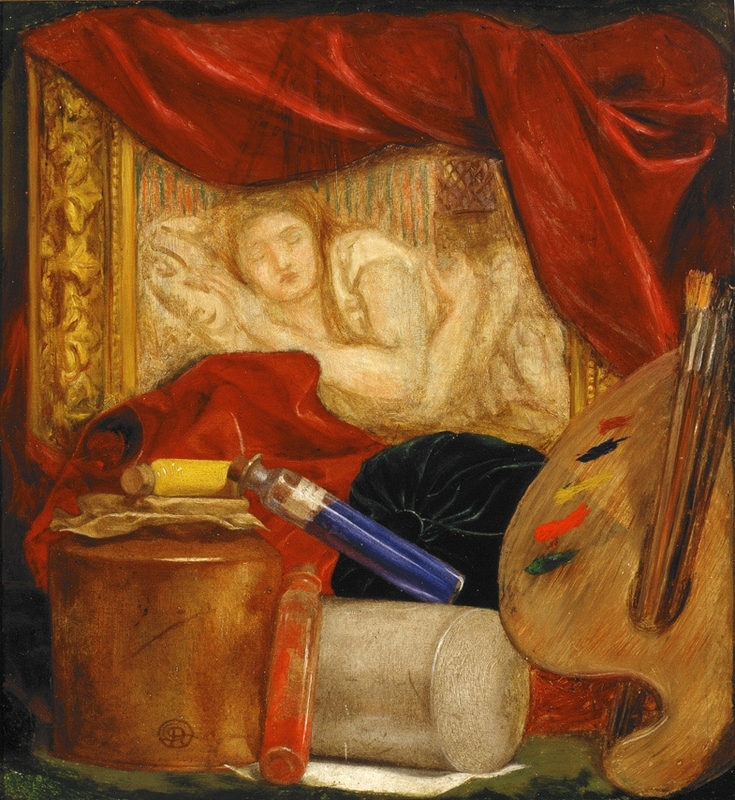 When about 14 he went to "Sass’s", an old-fashioned drawing school in Bloomsbury (central London), and thence, in 1845, to the Royal Academy schools, where he became a full student. Meanwhile, he read omnivorously-romantic and poetic literature, William Shakespeare, J.W. von Goethe, Lord Byron, Sir Walter Scott, and Gothic tales of horror. He was fascinated by the work of the American writer Edgar Allan Poe. 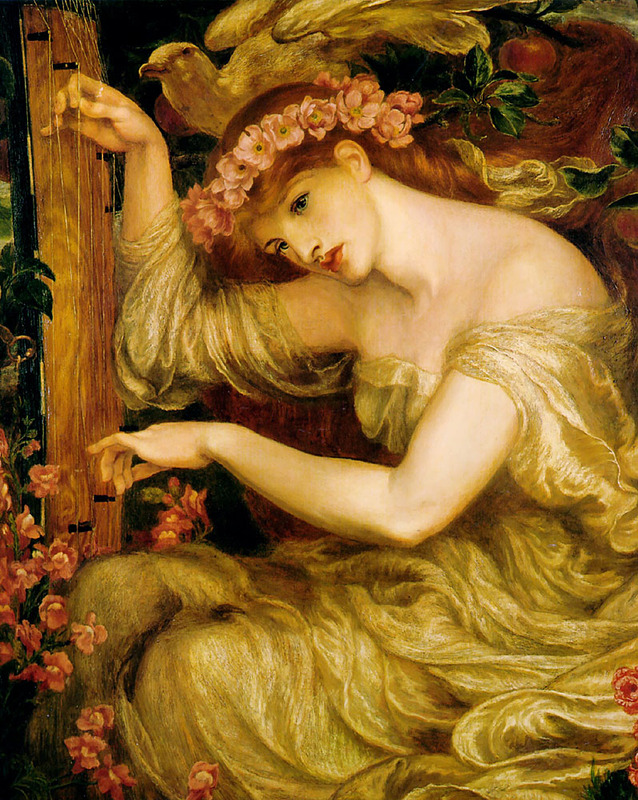 In 1847 he discovered the 18th-century English painter-poet William Blake through the purchase of a volume of Blake’s designs and writings in prose and verse; the volume has since been known as the Rossetti MS. Blake’s diatribes against the painter Sir Joshua Reynolds encouraged Rossetti to attempt lampoons of his own against the triviality of early Victorian paintings of anecdotal subjects, those of Sir Edwin Landseer being a special target of his derision. 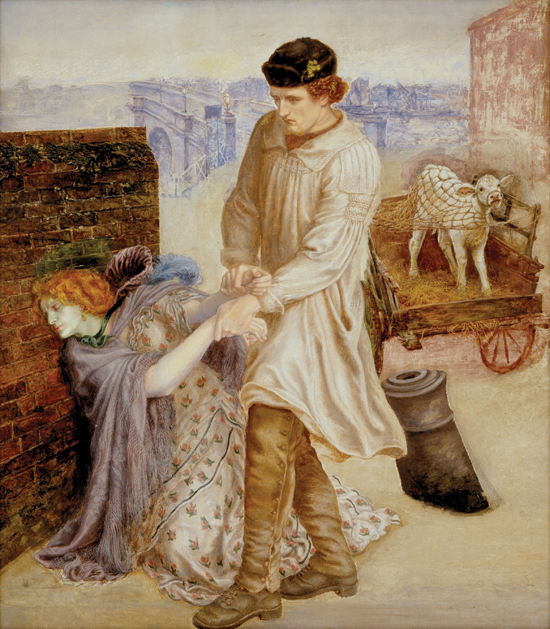 By the time Rossetti was 20, he had already done a number of translations of Italian poets and had composed some original verse, but he was also much in and out of artists’ studios and for a short time was, in an informal way, a pupil of the painter Ford Madox Brown. 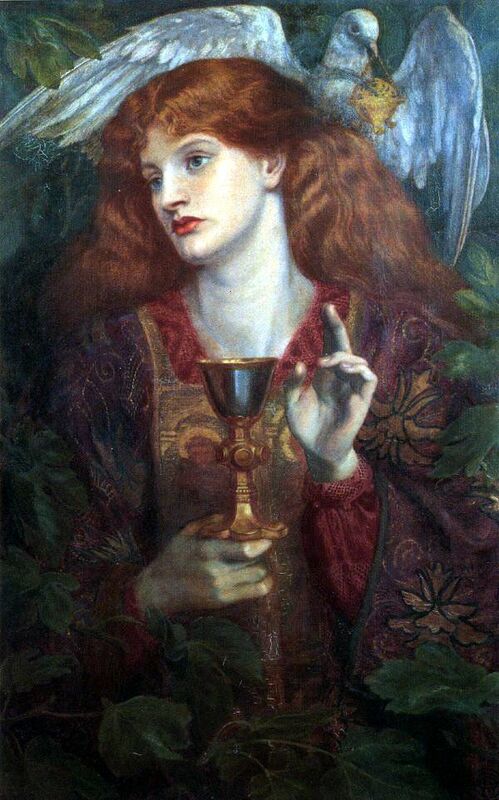 He acquired some of Brown’s admiration for the German "Pre-Raphaelites", the nickname of the austere Nazarenes, who had sought to bring back into German art a pre-Renaissance purity of style and aim. It remained to initiate a similiar reform in England. 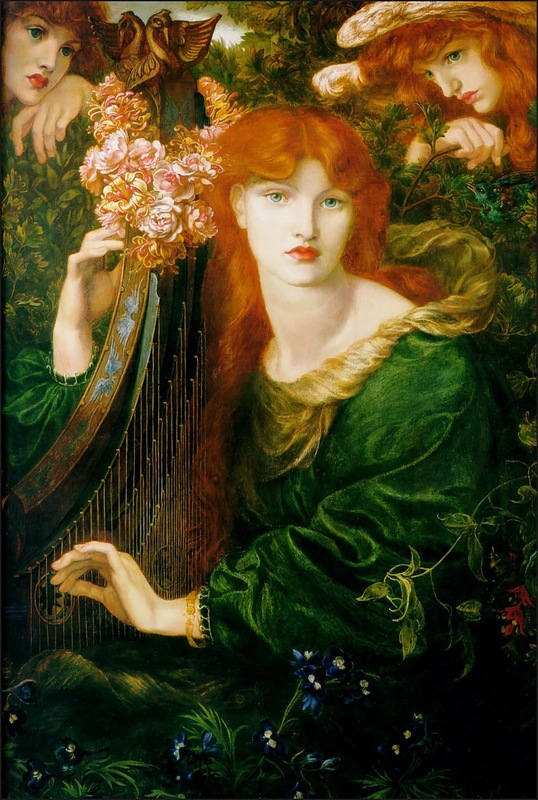 Largely through Rossetti’s efforts, the English Pre-Raphaelite Brotherhood was formed in 1848 with seven members, all Royal Academy students except for William Michael Rossetti. 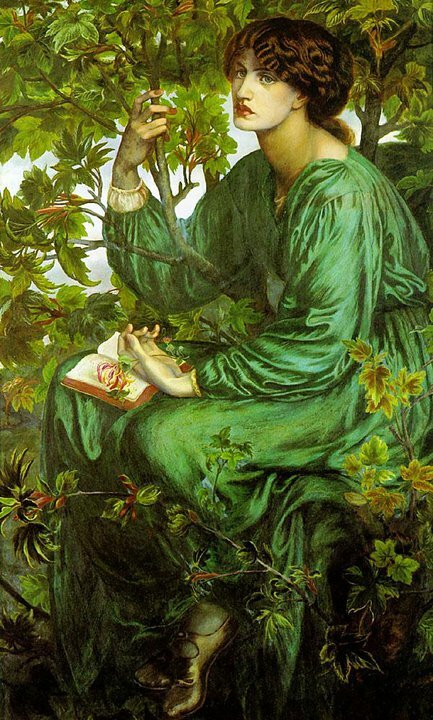 They aimed at "truth to nature", which was to be achieved by minuteness of detail and painting from nature outdoors. 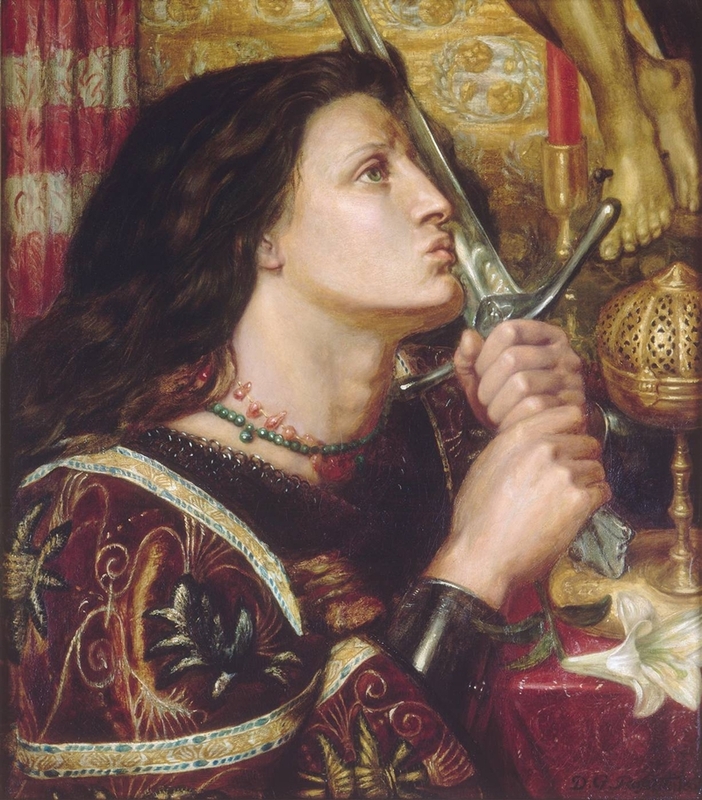 This was, more especially, the purpose of the two other principal members, William Holman Hunt and John Everett Millais. 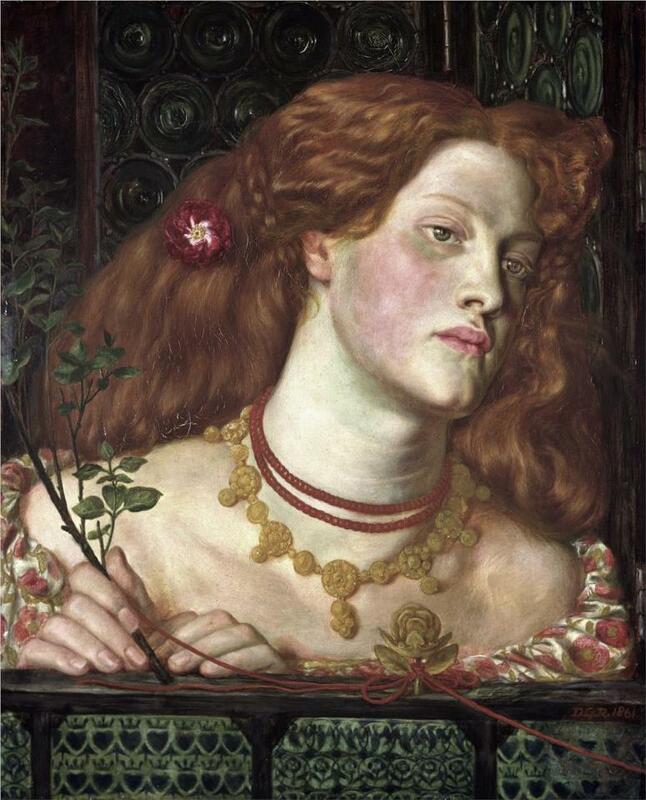 Rossetti expanded the Brotherhood’s aims by linking poetry, painting, and social idealism and by interpreting the term Pre-Raphaelite as synonymous with a romanticized medieval past. 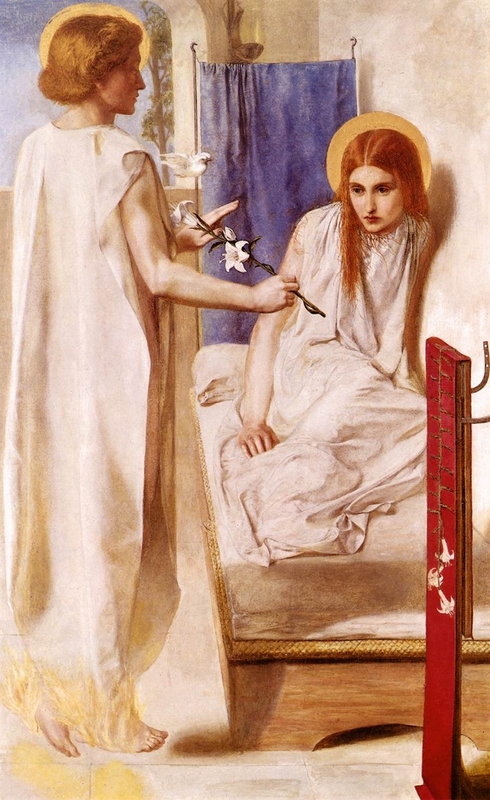 While Rossetti’s first two oil paintings-The Girlhood of Mary (1849) and Ecce Ancilla Domini (The Annunciation; 1850)-were simple in style, they were elaborate in symbolism. 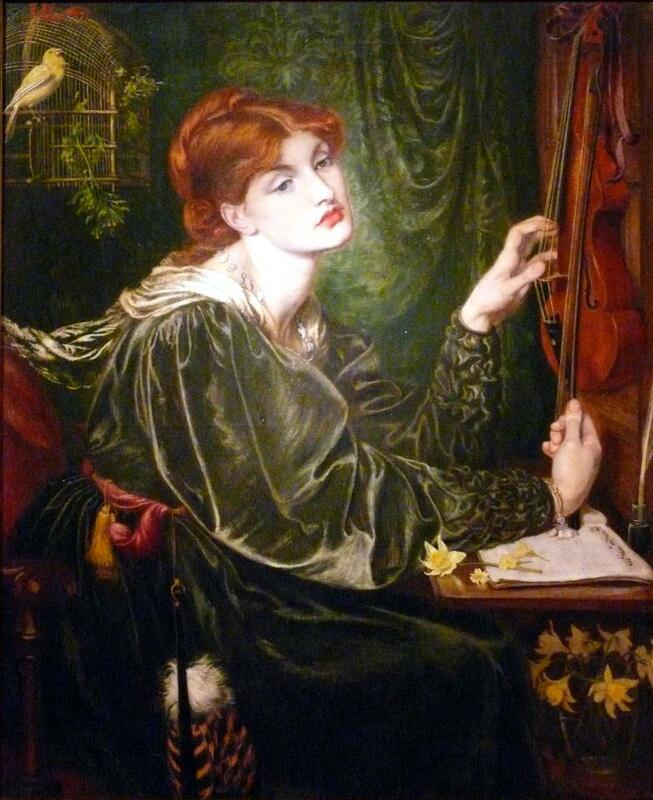 Some of the same atmosphere is felt in the rich word-painting and emotional force of his poem "The Blessed Damozel", published in 1850 in the first issue of The Germ, the Pre-Raphaelite magazine. 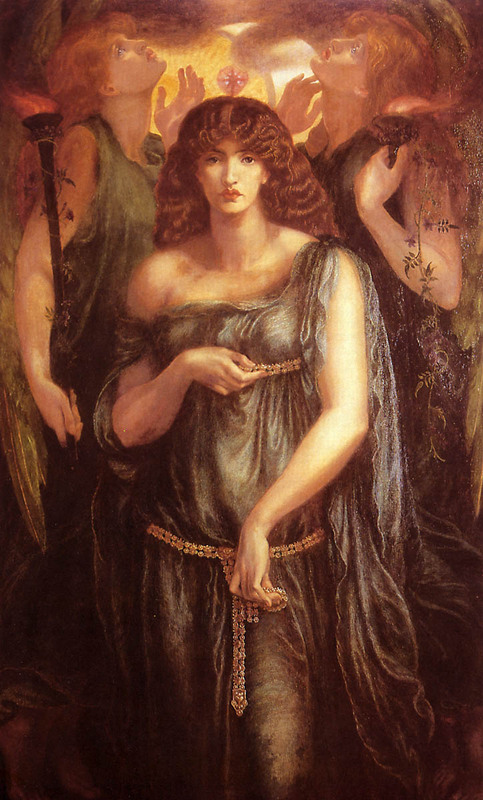 When it was exhibited in 1850, Ecce Ancilla Domini received severe criticism, which Rossetti could never bear with equanimity. In consequence, he ceased to show in public and gave up oils in favour of watercolours, which he could more easily dispose of to personal acquaintances. 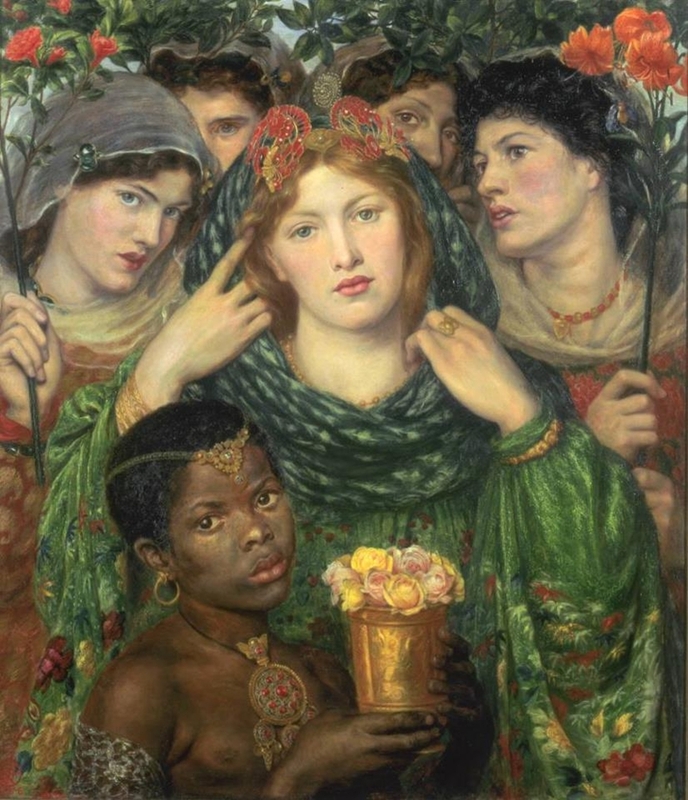 He also turned from traditional religious themes to painting scenes from Shakespeare, Robert Browning, and Dante, which allowed more freedom of imaginative treatment. 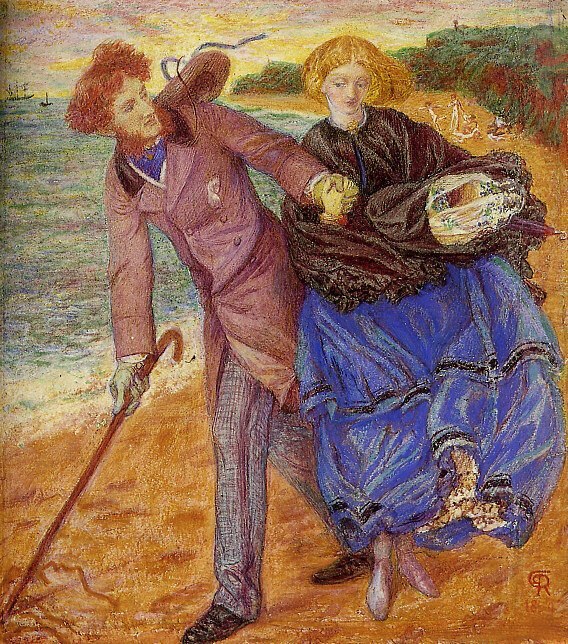 A typical example of his work from this period is How They Met Themselves (1851-60). 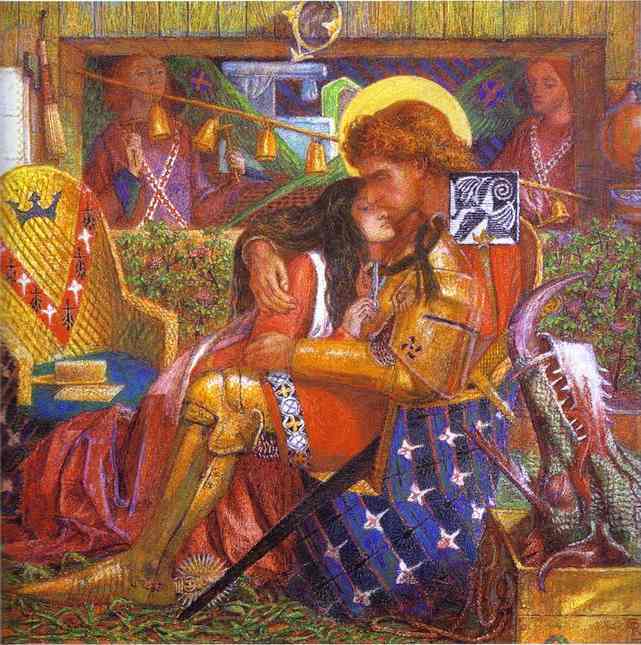 After 1856 Rossetti was led by Sir Thomas Malory’s Morte Darthur and Alfred, Lord Tennyson’s Idylls of the King to evoke in his paintings an imaginary Arthurian epoch, with heraldic glow and pattern of colour and medieval accessories of armour and dress. 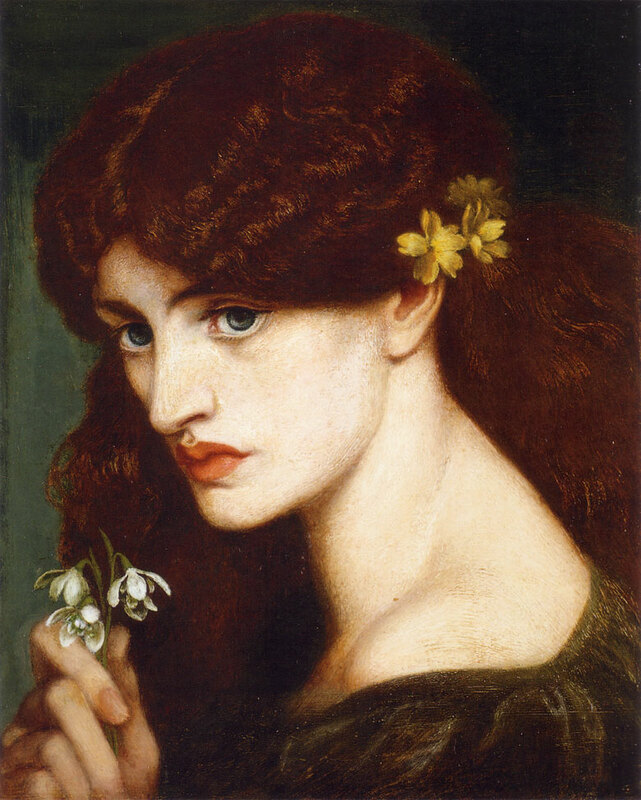 The 1850s were eventful years for Rossetti. 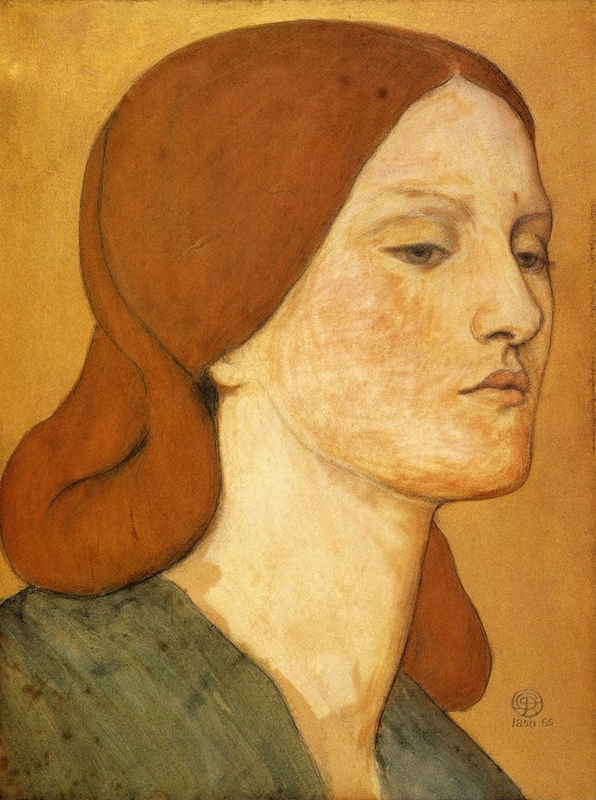 They began with the introduction into the Pre-Raphaelite circle of the beautiful Elizabeth Siddal, who served at first as model for the whole group but was soon attached to Rossetti alone and, in 1860, married him. Many portrait drawings testify to his affection for her. In 1854 he gained a powerful but exacting patron in the art critic John Ruskin. 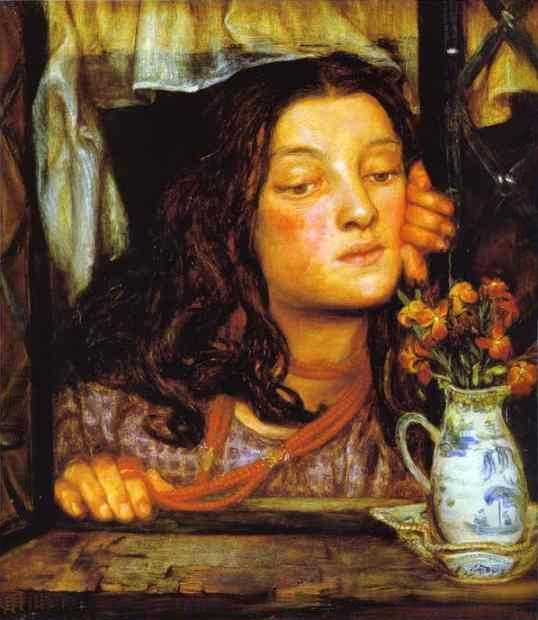 By then the Pre-Raphaelite Brotherhood was at an end, splintered by the different interests and temperaments of its members. 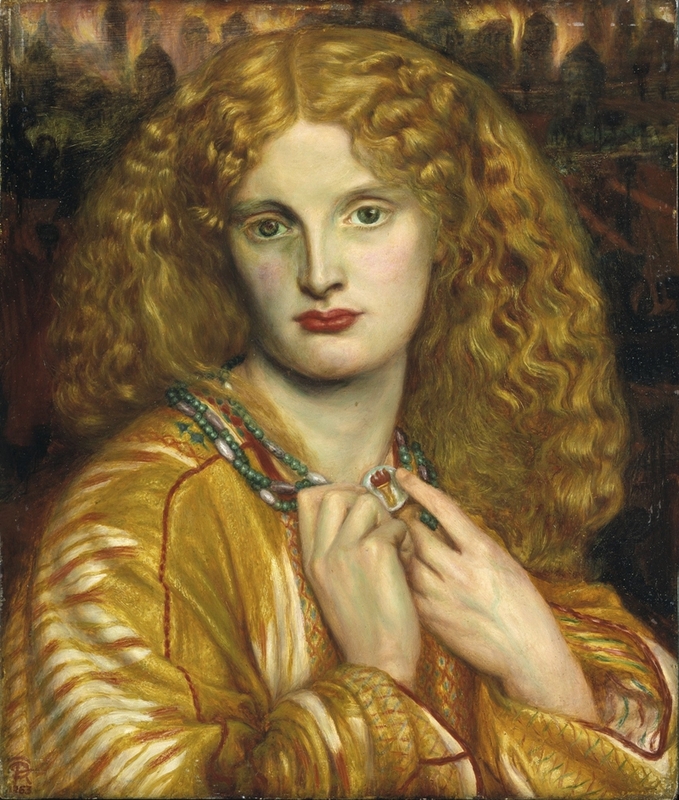 But Rossetti’s magnetic personality aroused a fresh wave of enthusiasm. 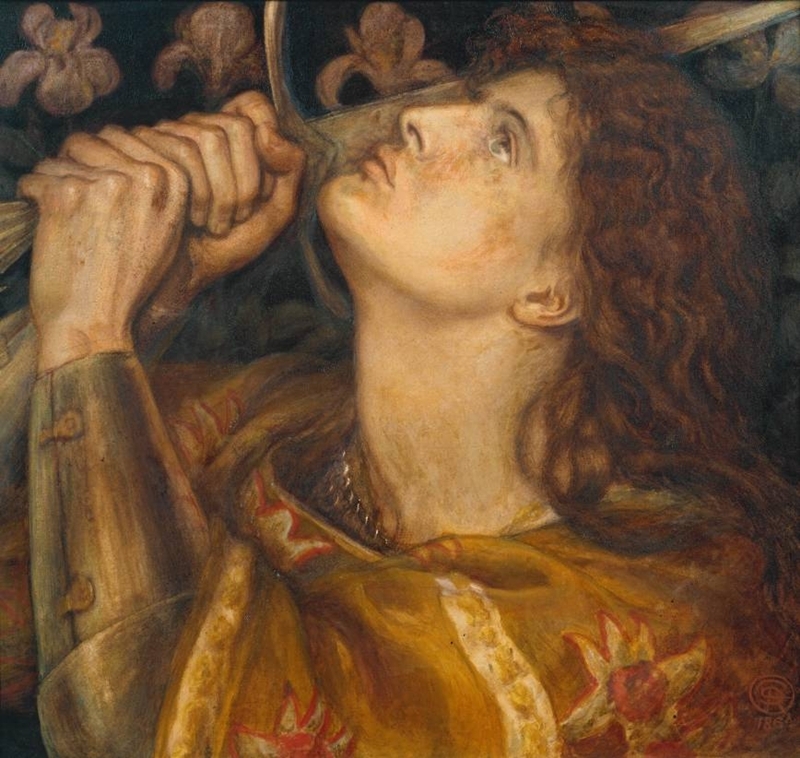 In 1856 he came into contact with the then-Oxford undergraduates Edward Burne-Jones and William Morris. 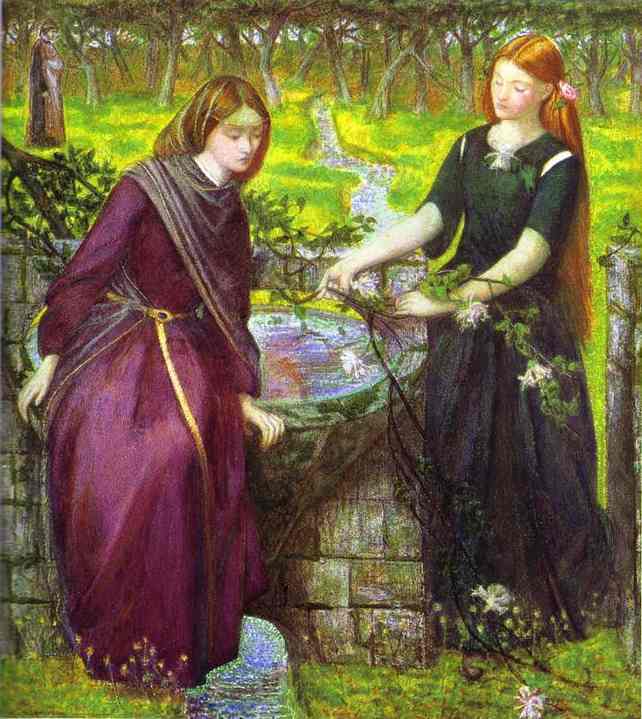 With these two young disciples he initiated a second phase of the Pre-Raphaelite movement. The two main aspects of this fresh departure were a romantic enthusiasm for a legendary past instead of the realism of "truth to nature" and the ambition of reforming the applied arts of design. 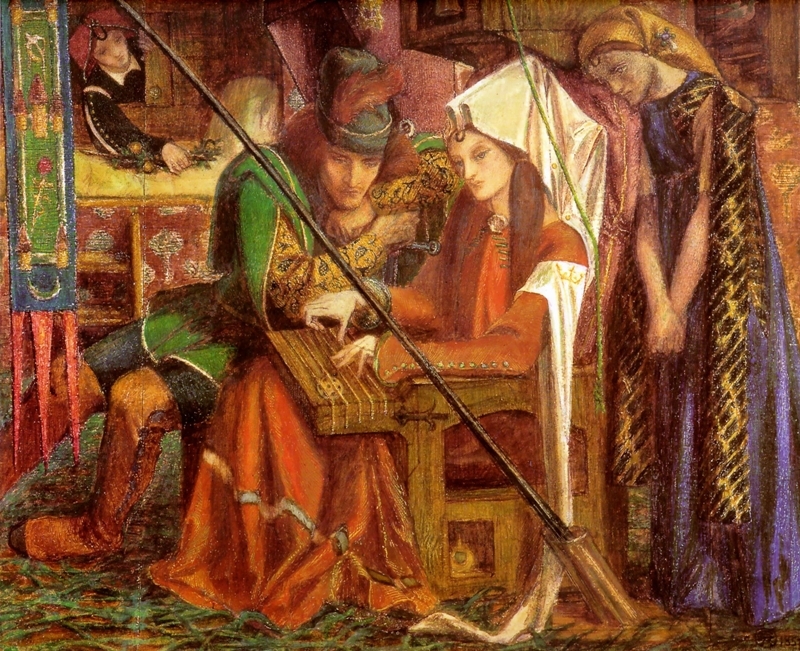 Rossetti’s influence not only led to easel pictures illustrating Arthurian legend but also into other fields of art. 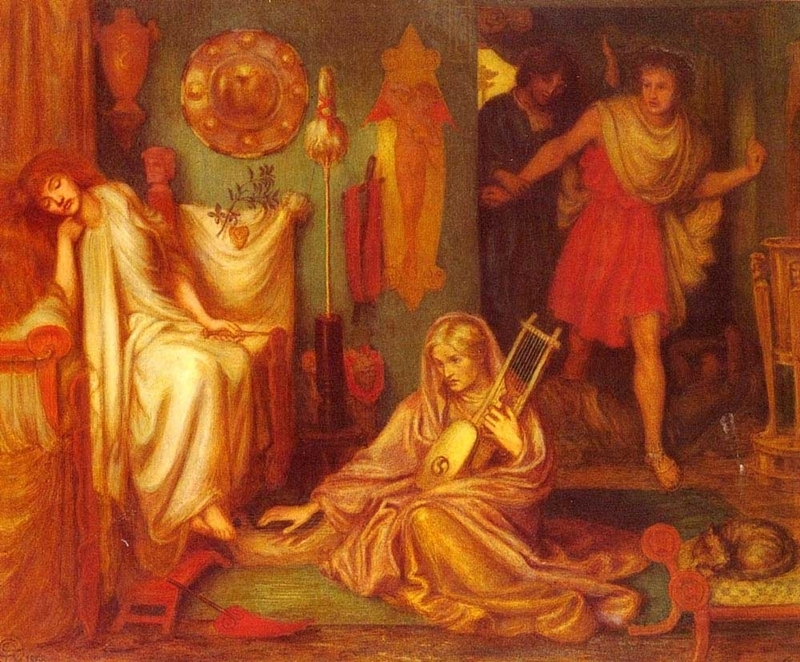 A new era of book decoration was foreshadowed by Rossetti’s illustration for the Moxon edition of the Poems (1857) of Tennyson. 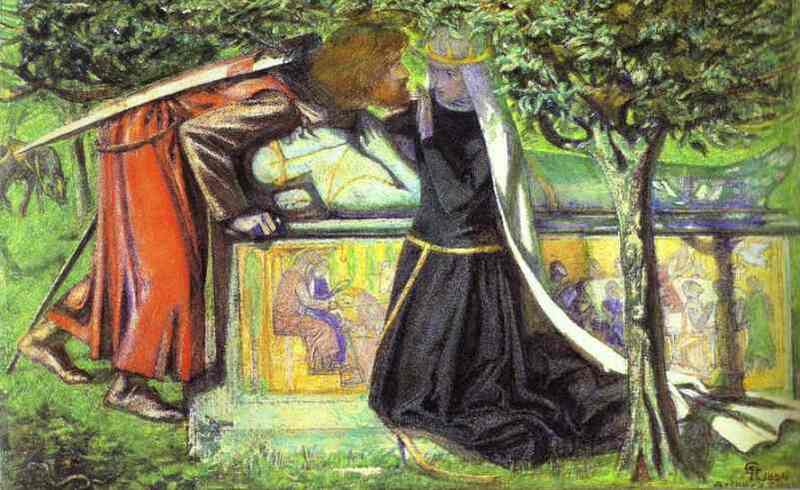 His commission in 1856 to paint a triptych (The Seed of David) for Llandaff Cathedral was a prelude to the ambitious scheme of 1857 to decorate the Oxford Union debating chamber with mural paintings of Arthurian themes. 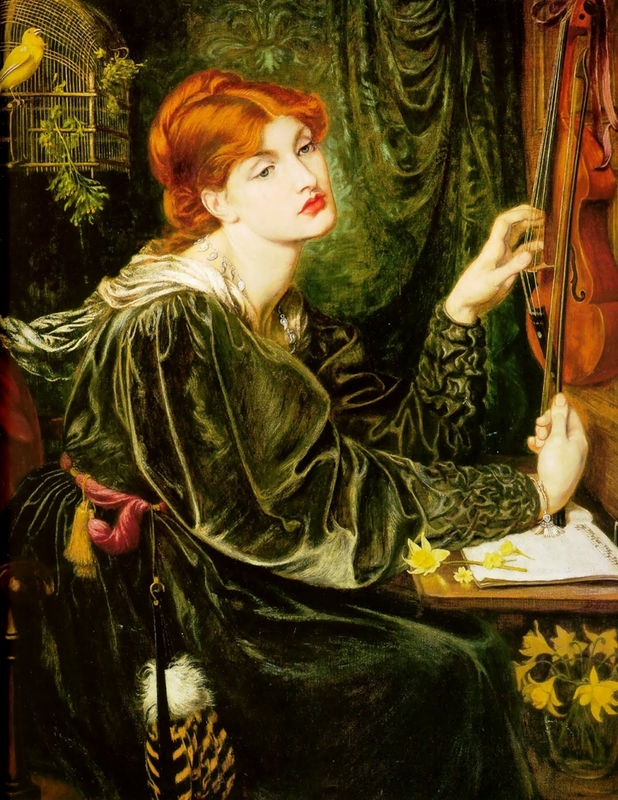 Though Rossetti and his helpers (Burne-Jones, Morris, and others) failed through want of technical knowledge and experience, the enterprise was fruitful in suggesting that the scope of art could be expanded to include the crafts. 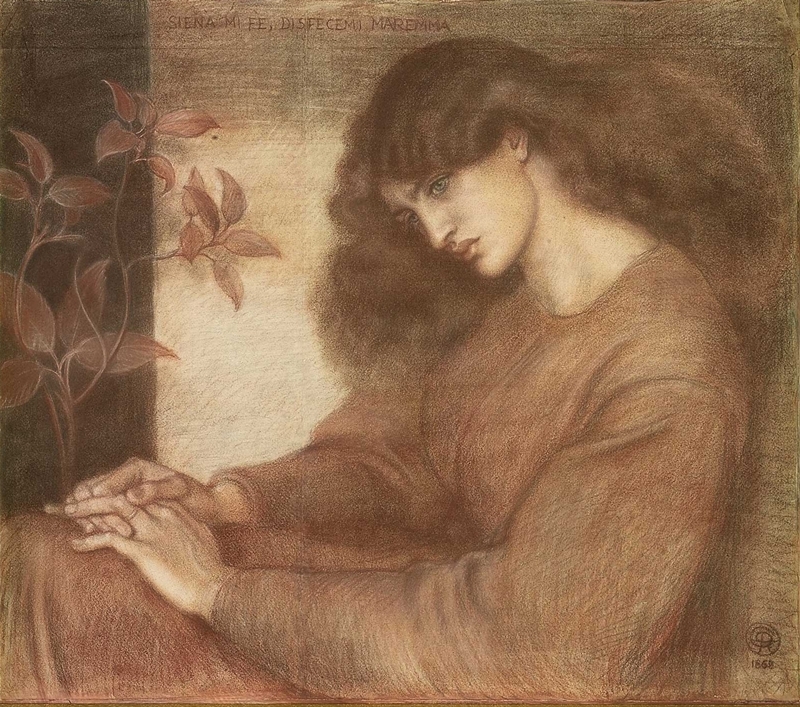 From 1860 onward, trials were part of Rossetti’s much-disturbed life. 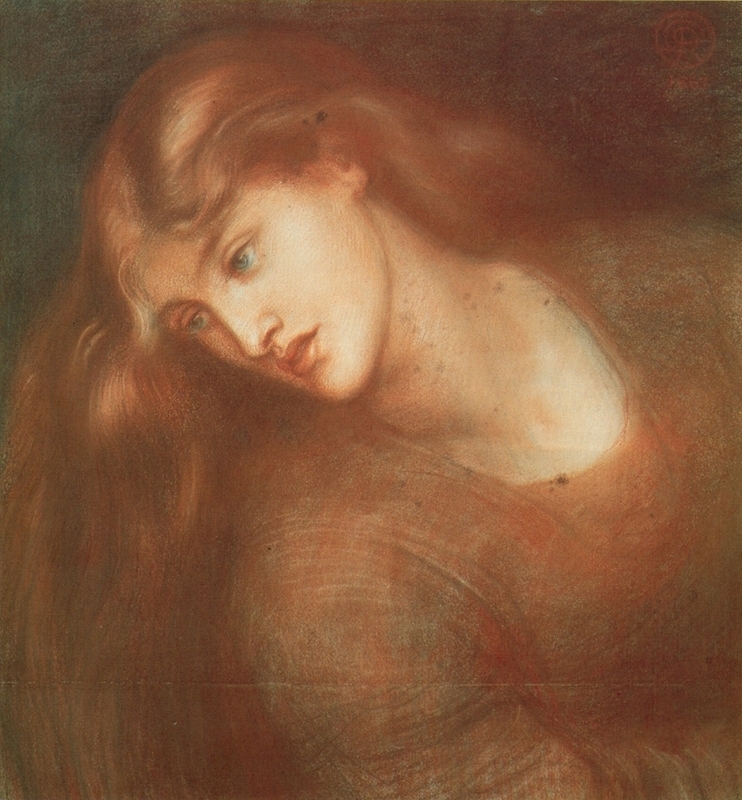 His marriage to Elizabeth Siddal, clouded by her constant ill health, ended tragically in 1862 with her death from an overdose of laudanum. Grief led him to bury with her the only complete manuscript of his poems. 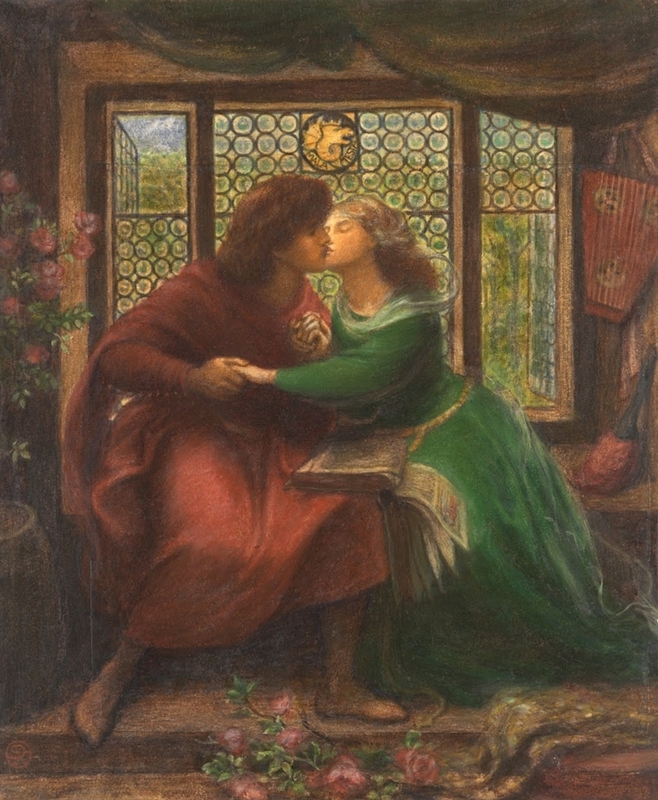 That he considered his love for his wife similar to Dante’s mystical and idealized love for Beatrice is evident from the symbolic Beata Beatrix, painted in 1863 and now in the Tate Gallery. 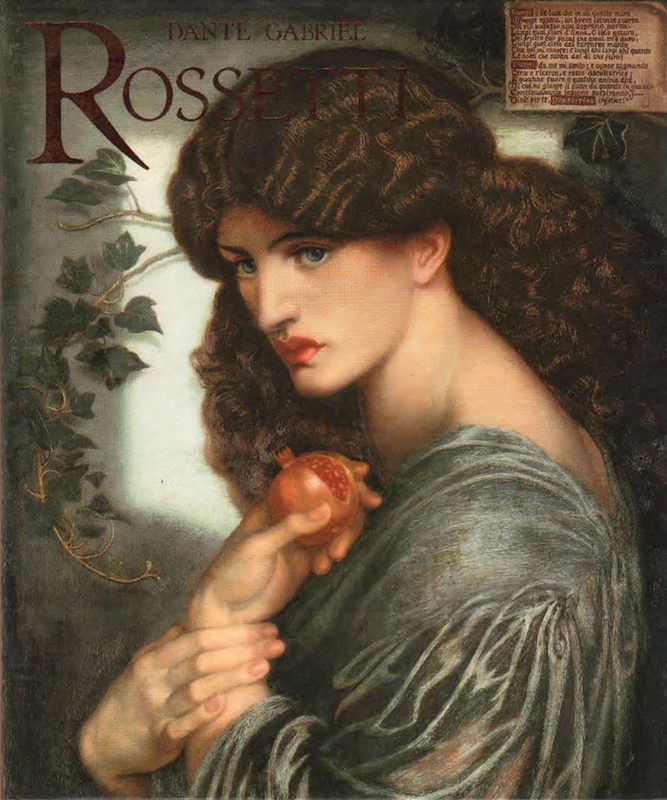 Rossetti’s life and art were now greatly changed. He moved from riverside premises in London’s Blackfriars to Chelsea. 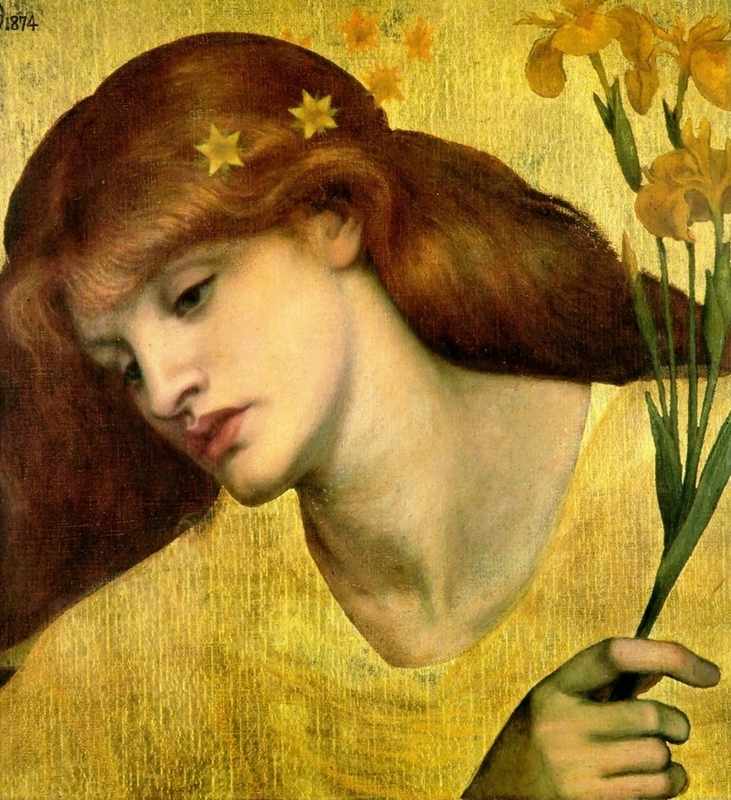 The influence of new friends-Algernon Charles Swinburne and the American painter James McNeill Whistler-led to a more aesthetic and sensuous approach to art. 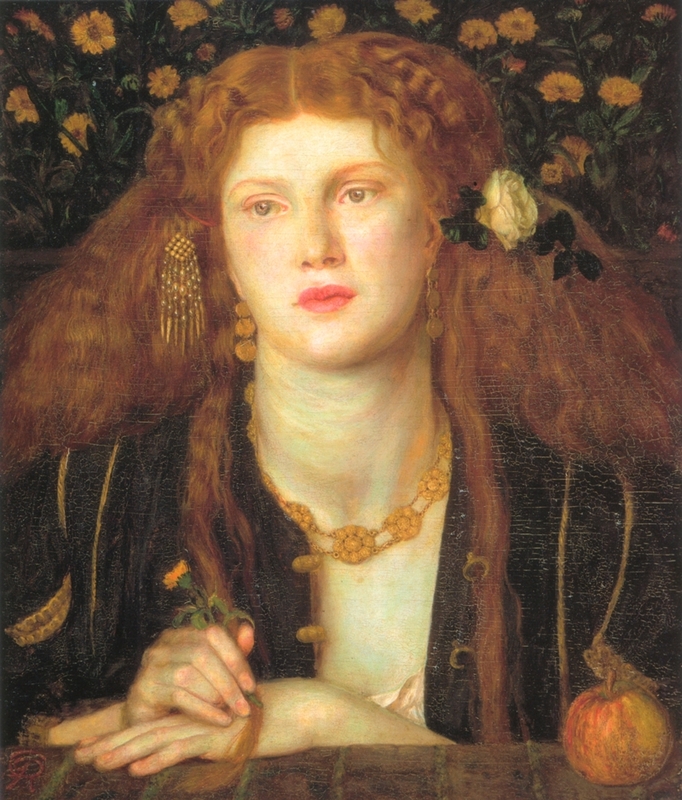 Literary themes gave way to pictures of mundane beauties, such as his mistress, Fanny Cornforth, gorgeously appareled and painted with a command of oils he had not previously shown. 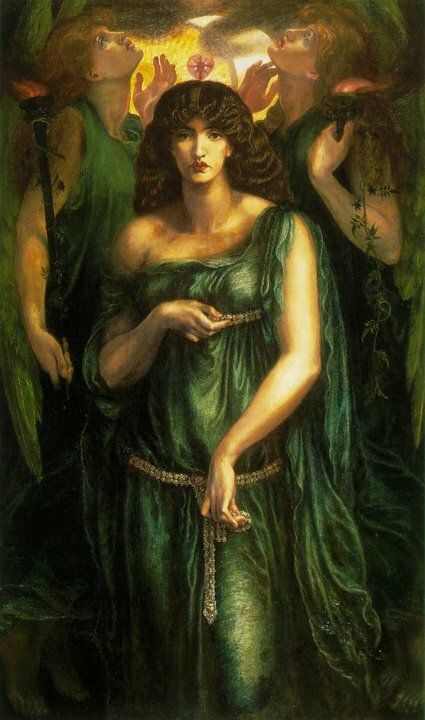 Among these works are The Blessed Damozel (1871-79), The Bower Meadow (1872), Proserpine (1874), and La Pia de’ Tolomei (1881). 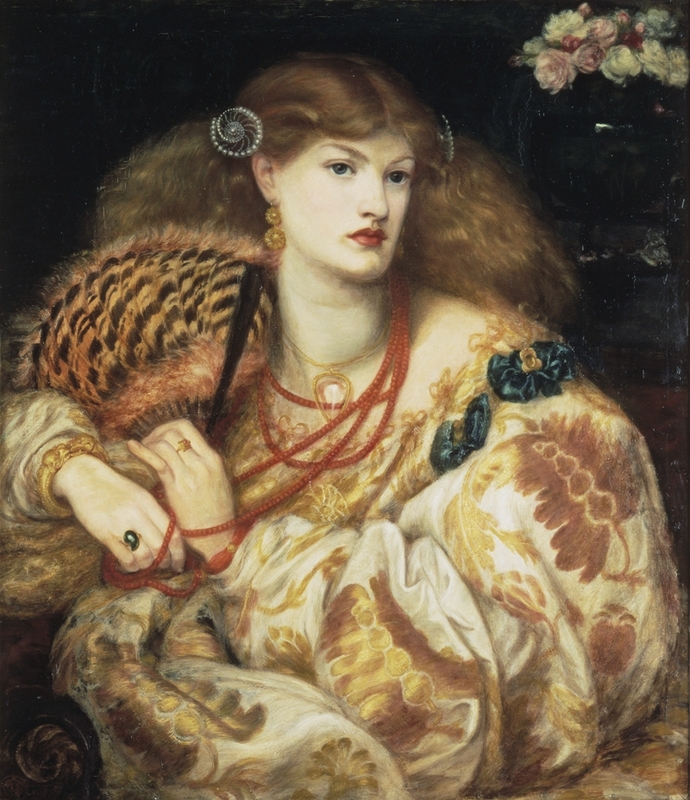 The luxuriant colours and rhythmic design of these paintings enhance the effect of their languid, sensuous female subjects, all of whom bear a distinctive Pre-Raphaelite facial type. 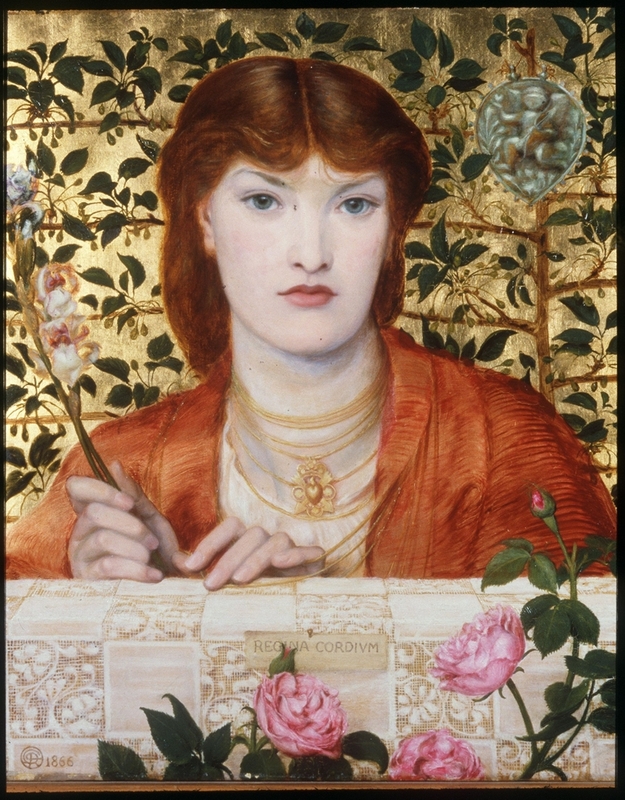 The paintings proved popular with collectors, and Rossetti grew affluent enough to employ studio assistants to make copies and replicas. He also collected antiques and filled his large Chelsea garden with a menagerie of animals and birds. 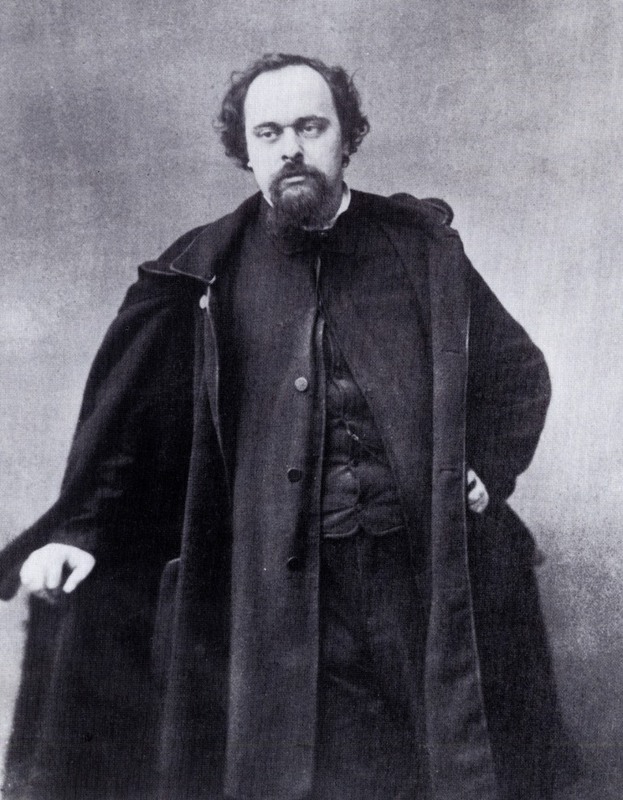 Rossetti had enjoyed a modest success in 1861 with his published translations, The Early Italian Poets; and toward the end of the 1860s his thoughts turned to poetry again. He began composing new poems and planned the recovery of the manuscript poems buried with his wife in Highgate Cemetery. 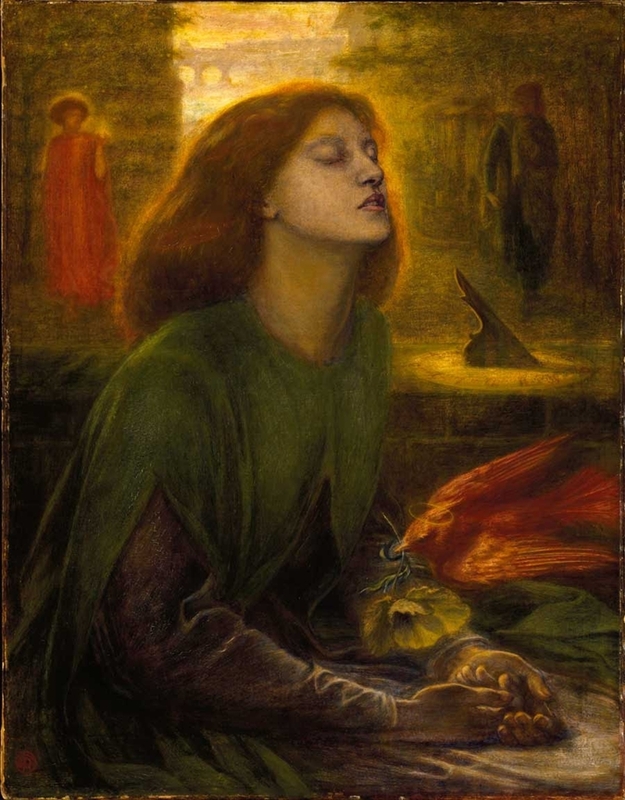 Carried out in 1869 through the agency of his unconventional man of business, Charles Augustus Howell, the exhumation visibly distressed the superstitious Rossetti. The publication of these poems followed in 1870. 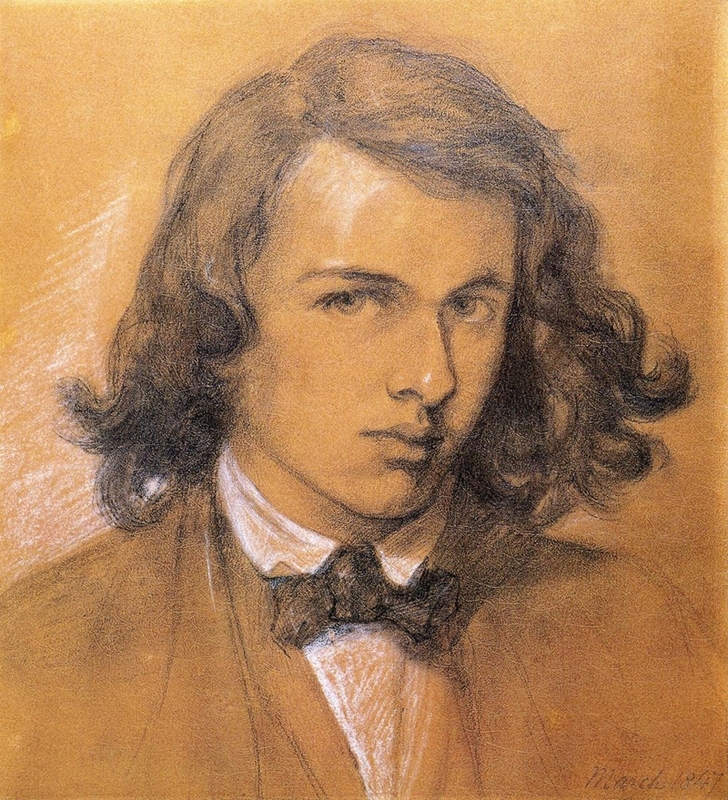 The Poems were well enough received until a misdirected, savage onslaught by "Thomas Maitland" (pseudonym of the journalist-critic Robert Buchanan) on "The Fleshly School of Poetry" singled out Rossetti for attack. 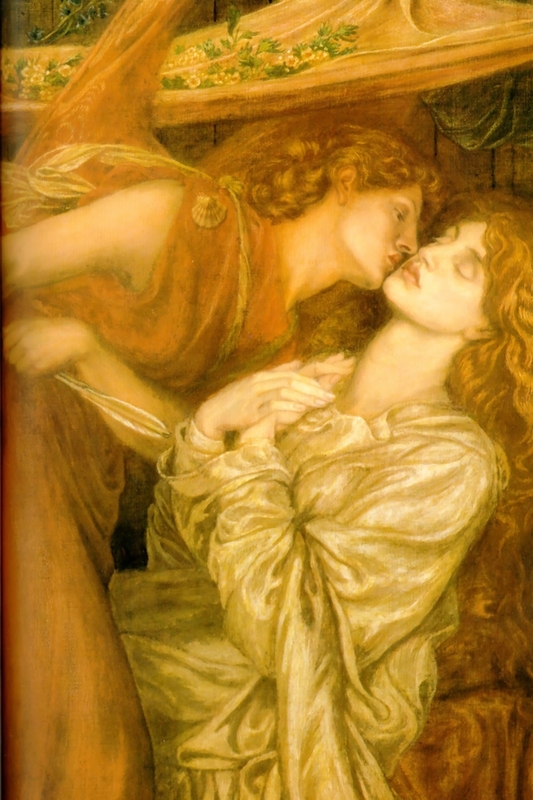 Rossetti responded temperately in "The Stealthy School of Criticism", published in the Athenaeum; but the attack, combined with remorse and the amount of chloral and alcohol he now took for insomnia, brought about his collapse in 1872. He recovered sufficiently to paint and write, but his life in Chelsea was subsequently that of a semi-invalid and recluse. Until 1874 he spent much time at Kelmscott Manor (near Oxford), of which he took joint tenancy with William Morris in 1871. 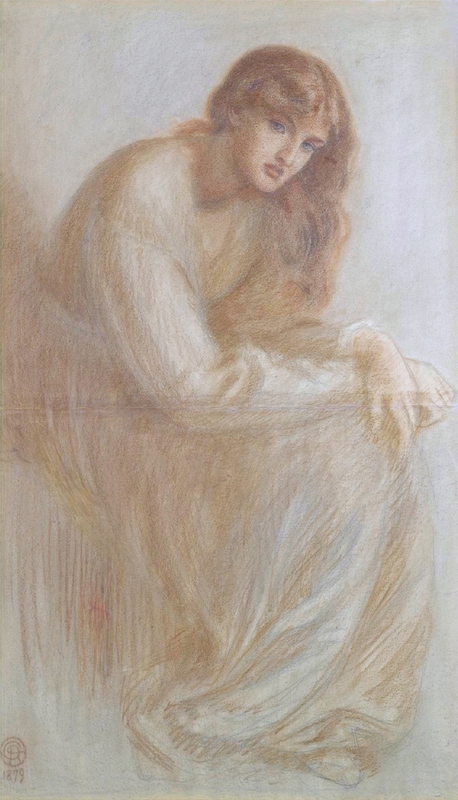 His lovingly idealized portraits of Jane Morris at this time were a return to his more poetic and mystical style. 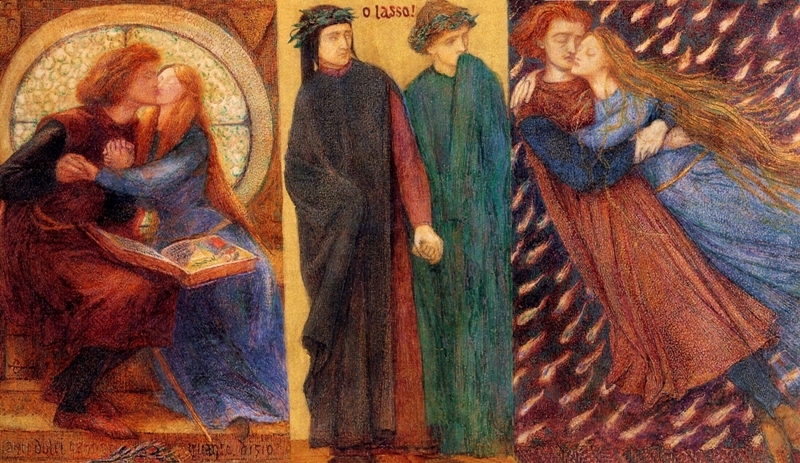 In the early 1880s Rossetti occupied himself with a replica of an early watercolour, Dante’s Dream (1880), a revised edition of Poems (1881), and Ballads and Sonnets (1881), containing the completed sonnet sequence of "The House of Life", in which he described the love between man and woman with tragic intensity. 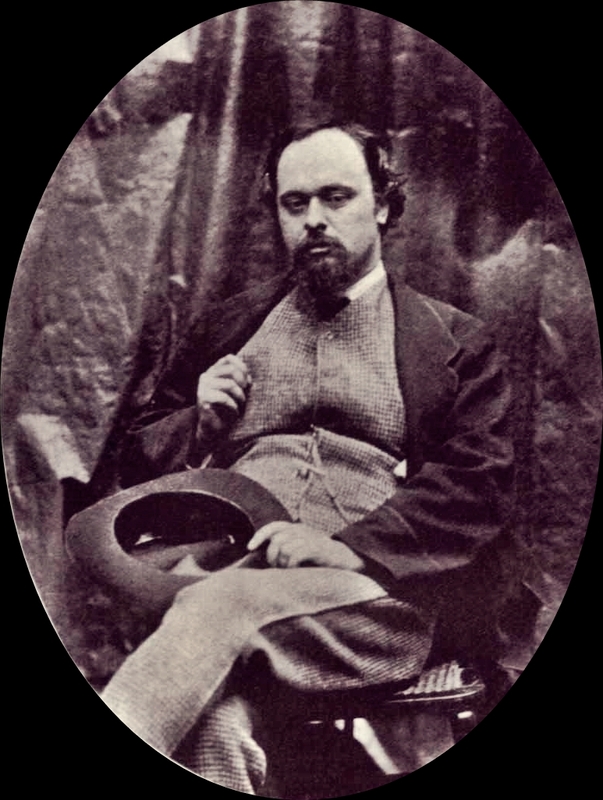 The lawyer and man of letters Theodore Watts-Dunton meanwhile did his best to put Rossetti’s financial affairs in order. 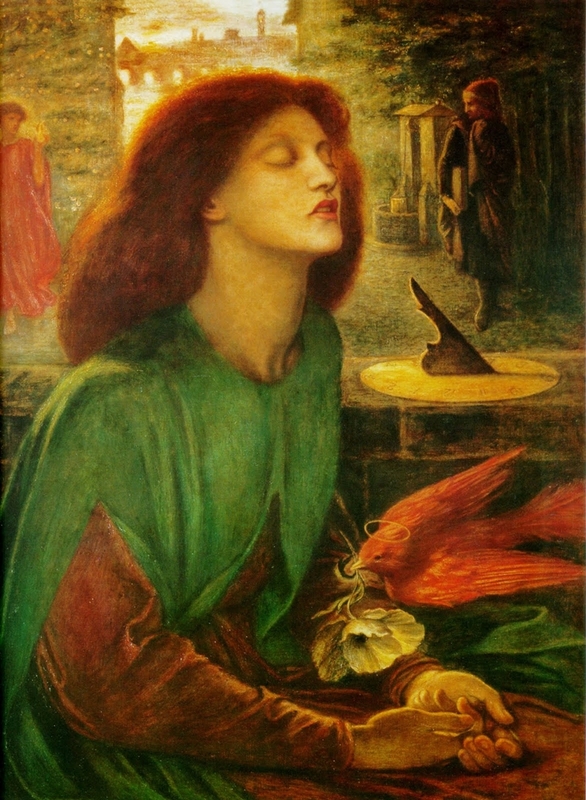 From a visit to Keswick (in northwestern England) in 1881, Rossetti returned in worse health than before, and he died the following spring. 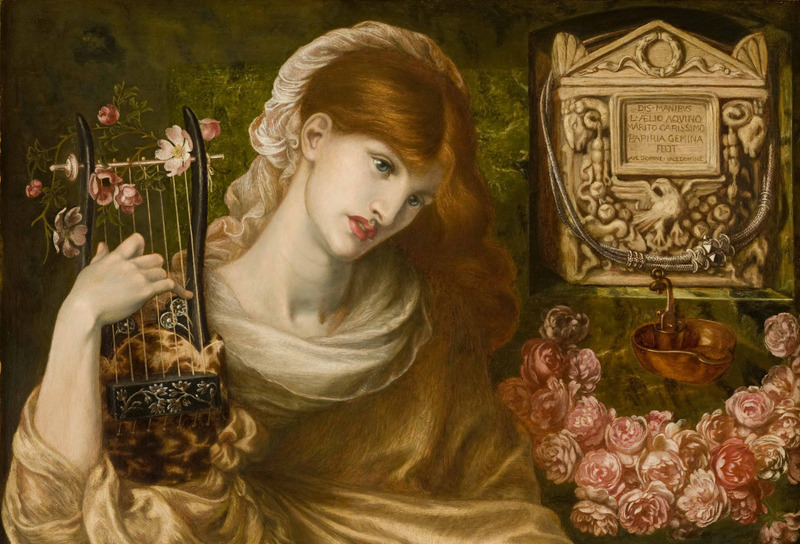 Through his exploration of new themes and his break with academic convention, Rossetti remains an important figure in the history of 19th-century English art. 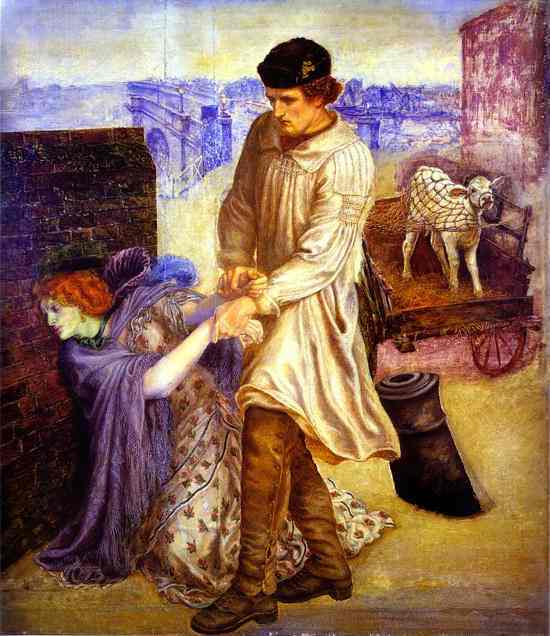 But his enduring worth probably lies as much in his poetry as in his painting. 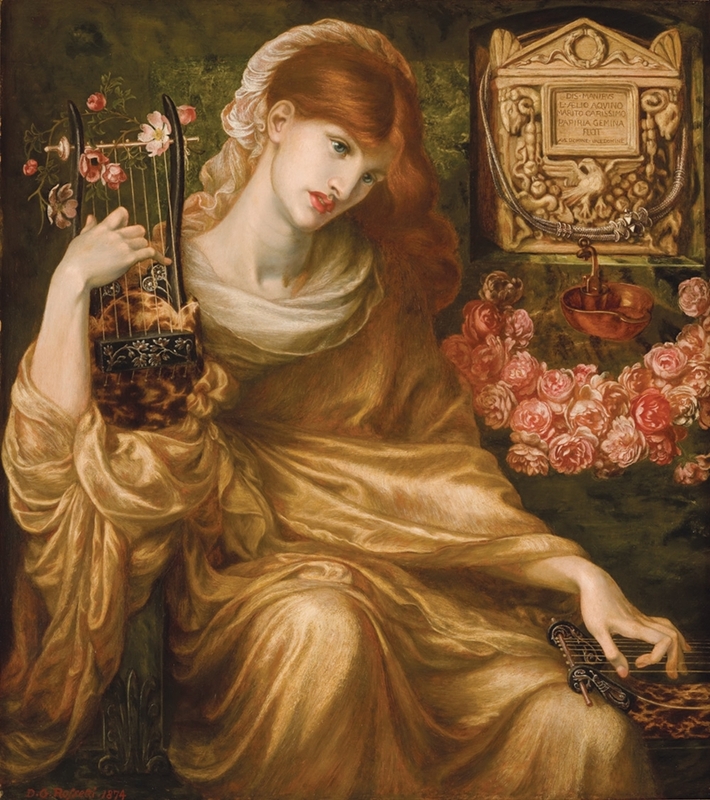 In contrast to his painting, where accumulated details of costume and greenery can become cloying, the detail in Rossetti’s poetry is subordinated to intensity of emotion and is employed to evoke a mood. It is by means of tiny and seemingly trivial touches, for example, that time is suspended in his poem "My Sister’s Sleep" and the very silence of the sickroom is heard. 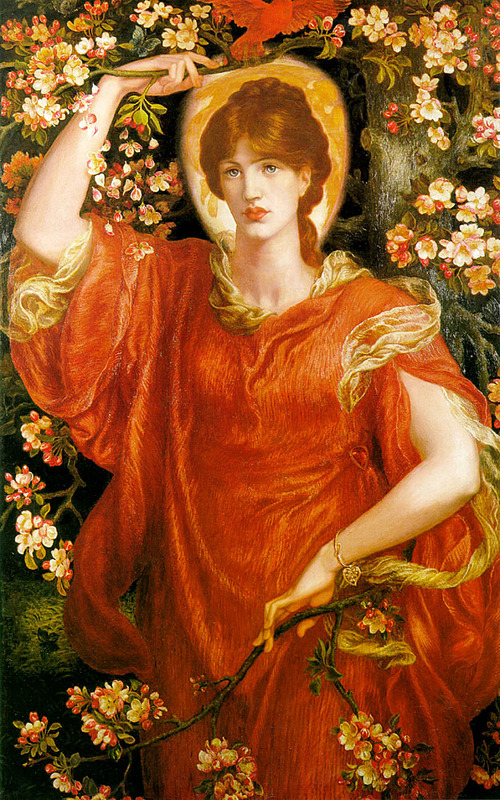 "The Wood Spurge" and the lyric "I have been here before" show Rossetti’s mastery of similar effects. The timeless moment is again caught with great skill in his sonnet "A Venetian Pastoral by Giorgione in the Louvre"- the most successful of his highly original attempts to translate well-known paintings into verse. "The Stream’s Secret", haunted by the ghost of his dead wife, evokes pity and regret by the power of its verbal music. 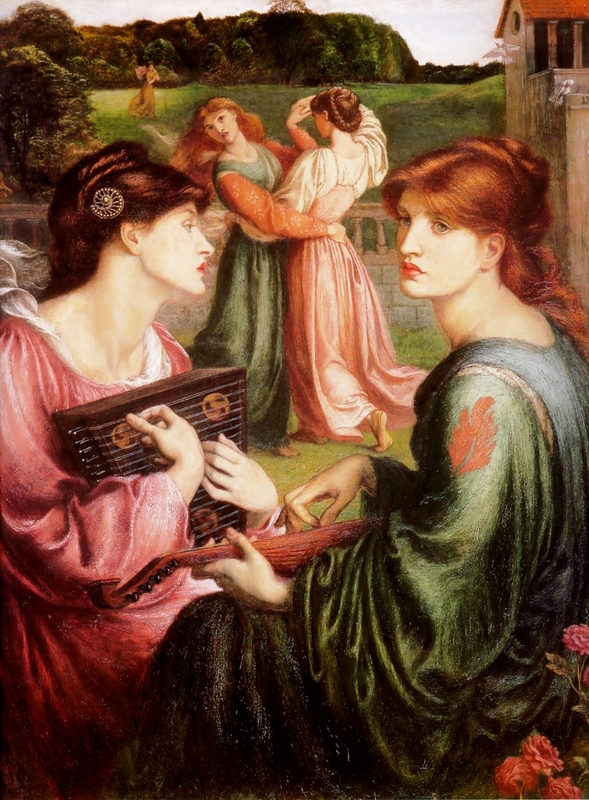 Rossetti was a natural master of the sonnet, and his finest achievement, "The House of Life", is a sonnet sequence unique in the intensity of its evocation of the mysteries of physical and spiritual love. Here, as he claimed against his detractors, "the passionate and just delights of the body are declared to be as naught if not ennobled by the concurrence of the soul at all times". 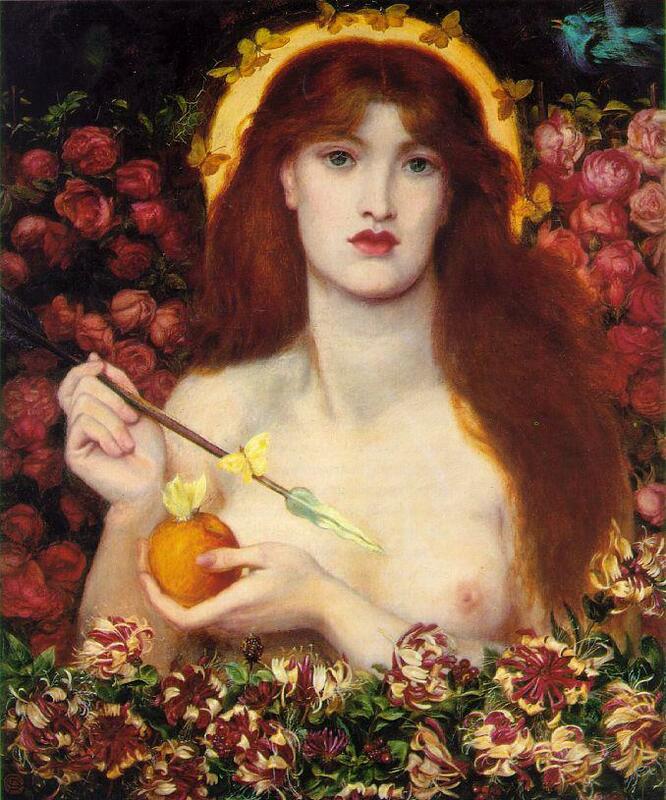 Rossetti’s poetic art had other, less subjective aspects. "The Last Confession", a tragic episode set against a background of the Italian Risorgimento, is a powerful dramatic monologue that can bear comparison with those of Robert Browning. 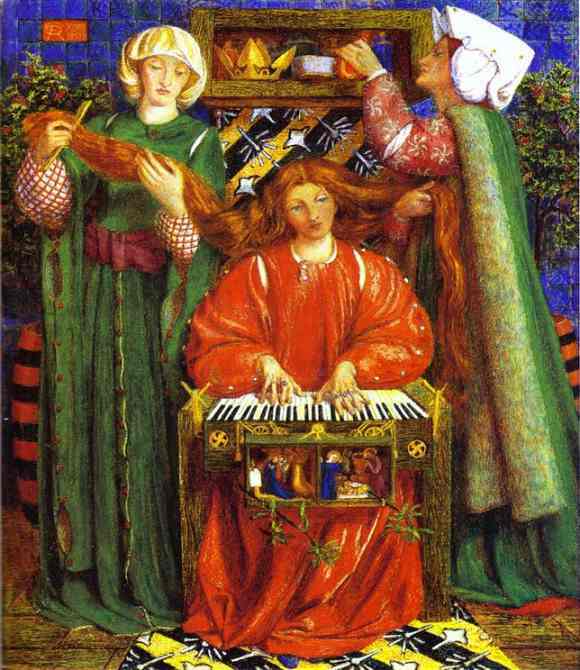 With his feeling for medieval subjects, Rossetti also caught the spirit of the ballad. 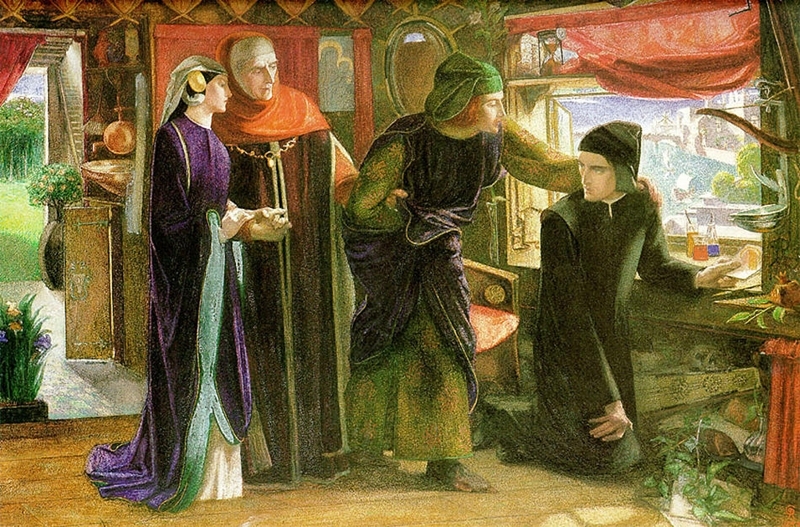 Few modern supernatural ballads are less artificial than "Sister Helen" and "Eden Bower"; and, among re-creations of the historical ballad, "The White Ship" and "The King’s Tragedy" are outstanding. 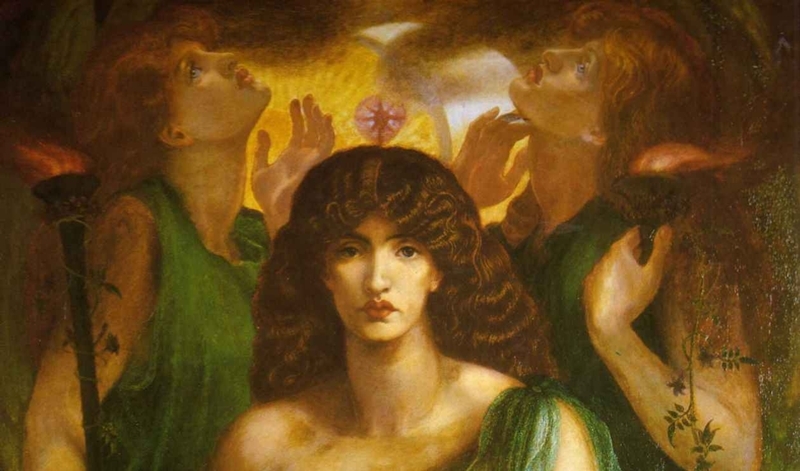 Early in Rossetti’s career, the sight of the great winged bulls in the British Museum evoked his poem "Burden of Nineveh" (1850), a meditation on the unpredictable course of history that is rich in word-music and far-ranging in imaginative vision. | by William Gaunt and John Bryson © Encyclopædia Britannica, Inc.
Dante Gabriel Rossetti [1828-1882] fu un pittore britannico, fondatore del movimento artistico britannico dei Preraffaelliti 1848, insieme a William Hunt, Ford Madox Brown e John Everett Millais. 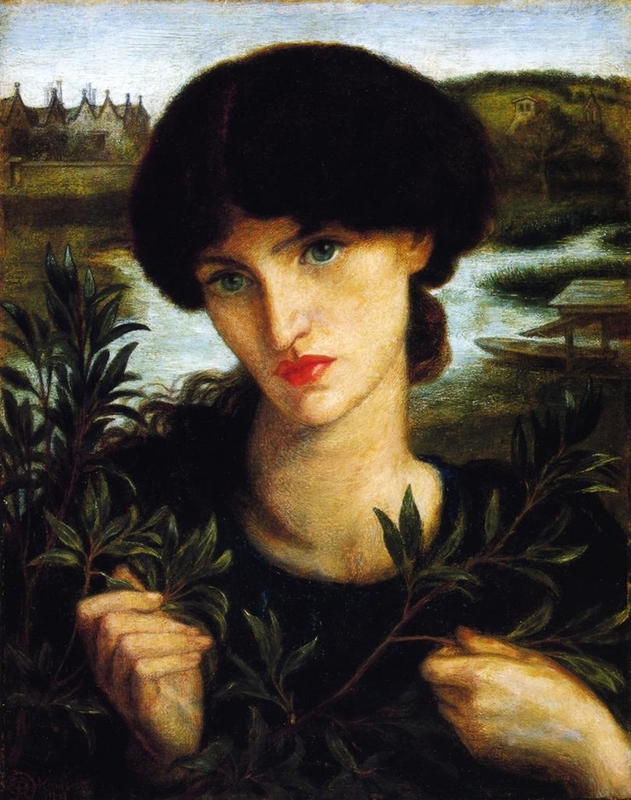 Dante Gabriel Rossetti nacque a Londra il 12 maggio 1828 da Gabriele Rossetti, un poeta e critico letterario italiano originario di Vasto in provincia di Chieti, e da Frances Polidori, una benestante dama britannica figlia di Gaetano Polidori [scrittore ed editore italiano originario di Bientina, attualmente in provincia di Pisa] e di Anna Maria Pierce, una governante inglese. 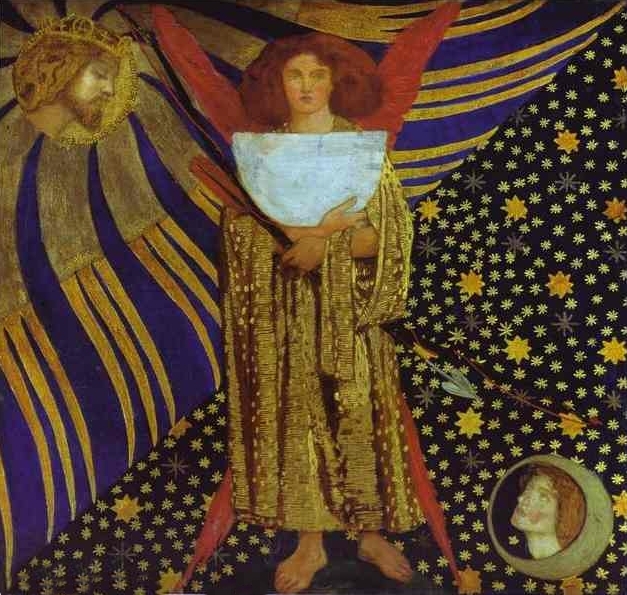 Nonostante la sua famiglia ed i suoi amici più stretti lo chiamassero "Gabriel", adottò ben presto il nome pubblico di "Dante Gabriel", desiderando un accento maggiormente letterario al proprio nome dati i suoi interessi nella poesia. 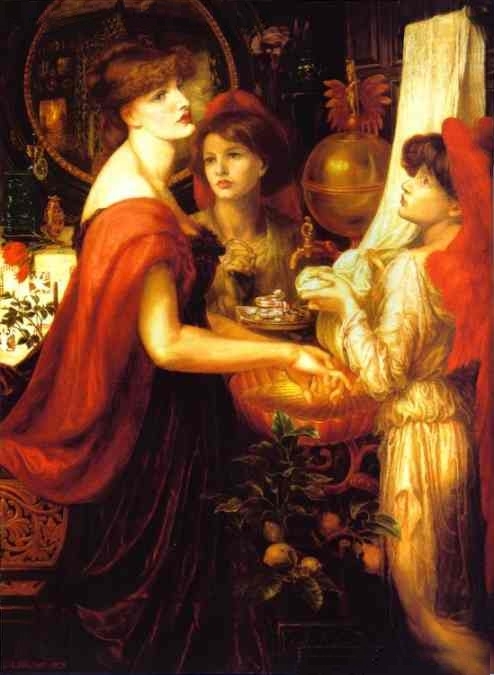 Fratello della poetessa Christiana Rossetti del critico William Michael Rossetti, Dante Gabriel si interessò sin dalla giovinezza a Dante ed ai poeti del Dolce Stil Novo, passione ereditata dai genitori, ma anche ai romantici inglesi, alle novelle gotiche e agli scrittori americani come Edgar Allan Poe. I suoi dipinti sono ascrivibili alla corrente europea del Simbolismo. 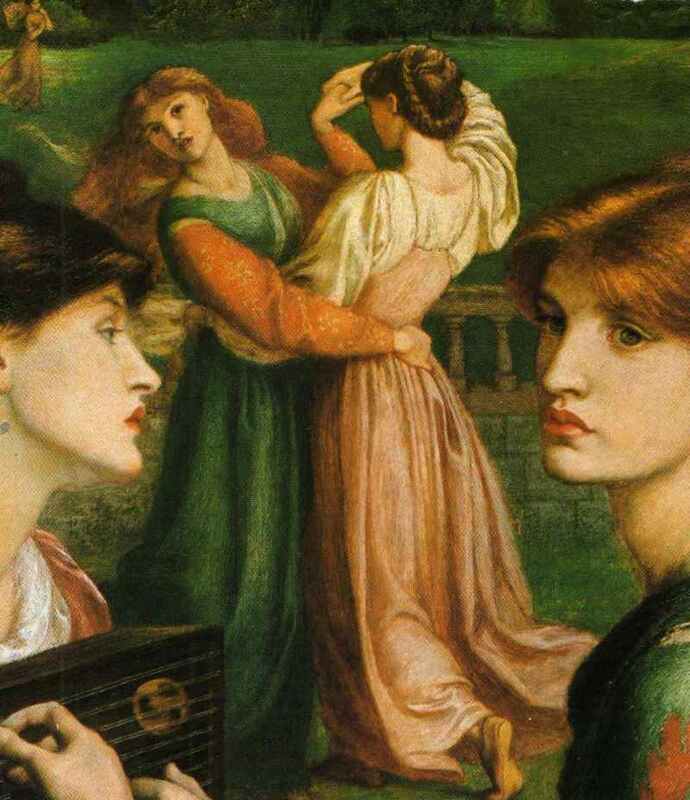 I quadri preraffaelliti di Rossetti sono pervasi da una dimensione del silenzio che risuona di note sensuali e decadenti. 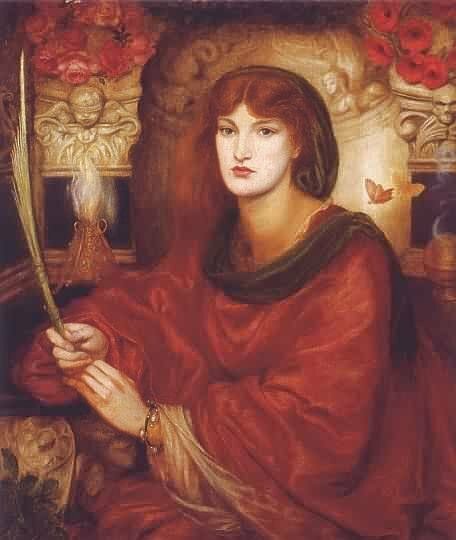 La figura femminile è sempre presente, svolgendo un ruolo simile a quello di Beatrice per Dante: lo svelamento, attraverso la bellezza, della dimensione trascendentale. 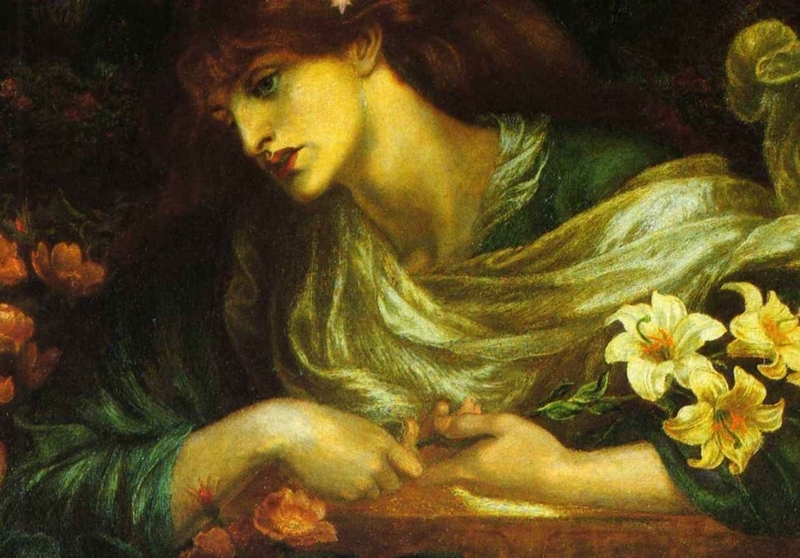 Dante Gabriel Rossetti fu anche poeta, riproponendo nei suoi sonetti la stessa poetica di estetizzazione spiritualizzata ed ultra-raffinata che caratterizza anche i suoi quadri.